So true! That used to irritate the hell out of me in school. Now that I am a writer, I really know the teachers were full of crap! 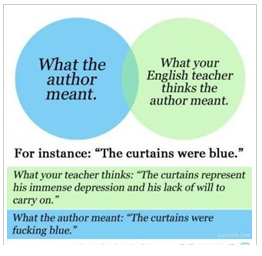 My daughter is an English major and I can tell you for a fact that you’ve drastically over-simplified the English teacher’s interpretation. If you don’t bring the “signifying monkey” in, you’re just not getting it.